Times Square is the crossroads of the world, at least to the million plus people who pass through the square every day and to the hundreds of millions of people who see it daily on television broadcast coverage from the area. Prominent in any coverage of Times Square is one building that stands out, not so much for its height or shape, but more for its decorative vinyl and electronic cladding, and its unique address: One Times Square. If any building has the number one place and was to be dedicated as a homage to sign display, honors could easily point to One Times Square. It stands tall not only in height, but with an influence to iconic advertising, to sign display with its vinyl and electronic billboards and timeless metaphors, all wedded to the building from top (the annual New Year's Eve ball drop) to bottom (the news zipper wrapped around the building's base). If Times Square is the crossroads of the world, then One Times Square is one of its guardians and attractions that brings the world's citizens to Times Square for that moment of cosmopolitan contact. For all the different things that One Times Square is (tourist attraction, a New Year's Eve beacon and news center with its digital reader board), the building is primarily a sign tower. Sign placements are like real estate, it's location, location and location, and for sign positioning, on an average day Times Square will see at least one to one and a half million people cascading through its streets and sidewalks. For New Year's Eve, with worldwide television coverage there are at least one billion viewers eyeballing this building. One Times Square's roots go back to the early 20th century when the newspaper, The New York Times was building The Times Tower, its new headquarters in what was then called Long Acre Square. As its steel skeleton ascended into the sky, it was covered in brick, terra cotta and limestone. Upon completion in 1904, the 25 story skyscraper, at 395 feet was acknowledged the second tallest building in the world. As The Times Tower made its presence known, the surrounding area was renamed Times Square which even then with its Broadway theaters and New Year's Eve celebrations (also started by the NY Times) began to become the 'town square' of Manhattan. The New York Times began conducting roof-top celebrations for New Year's Eve when the building was completed in 1904. 1907 was the first year the New Year's Eve Ball dropped from the building's roof. With its height, its tower could be seen for miles around midtown Manhattan and it became the perfect place for this rooftop celebration. Making it an illuminated ball increased its night visibility and was also a chance to show off a new technology - electricity. It's been an annual tradition ever since. Its first actual connection to the sign industry was in 1928 when the New York Times encircled its building with its famous "zipper" headliner. This was one of the earliest outdoor incandescent message reader boards that provided the passing public with electronic messages about the breaking news as it happened. In an interesting note, Times Square is now flooded with various evolved reader boards (Reuters, ABC, Morgan Stanley, etc) all based on the original 1928 Times Tower electric message board. The Times Tower served its original masters until 1961, when Douglas Leigh (the man who brought animated billboards to Times Square and immortalized Time Square with its famous Camel billboard with its smoking ring) purchased and renamed the tower for the Allied Chemical Company, its major tenant at the time. To modernize its look, the entire building was reclad with a sleek marble exterior of vertical columns and panels. Even with its white vertical corrugated look, it continued its original traditions of displaying the zipper around the building and on top, the ball drop at the stroke of midnight, New Years Eve. Although it already had a prominence in Times Square in 1996, it again exchanged owners and its new masters, Sherwood Outdoor and Jamestown One Times Square acquired One Times Square. In preparing the building for upcoming use, it became obvious during the planning stage that it was not going to be cost effective to rehabilitate the building for new tenants to occupancy as explained by Paul Collins, operations manager of Sherwood. "The last building upgrade was in 1965 by its then owner Allied Chemical. To bring the building up to 1996 standards with new wiring, new HVAC (heating, venting and air conditioning) and mechanical upgrades turned out not to be feasible from a financial point of view, given the smallish physical space that each floor provided." Fortunately an even more appealing choice appeared: transforming the building from a tenant occupied facility into a sign tower literally at the cross roads of Times Square. The building was then marketed as a sign tower and in no time became a benchmark for representing Times Square. To implement this strategy, the building remained tenantless. To allow the vinyl signs to be properly attached to the building, a billboard frame was placed completely around One Times Square from just above the zipper, completely to the roof, 23 stories above. Given the space allotment for each potential billboard, the building sign grid was positioned for twenty-two different sign placements (five electronic and 17 vinyl). Three of the four sides of One Times Square are completely covered in vinyl sign faces. Its North side, the world renown side that faces the Times Square 'bow tie' where 7th Avenue crosses Broadway, is completely covered from top to bottom in electronic LED video and in one case, an LED and neon billboard. Reviewing its famous side first and starting from the top down, the uppermost LED sign is Discover card (LED video screen by Panasonic), below that TDK Electronics (LED video screen by Daktronics), Nisson Cup of Noodles (backlit flexible face with a background of neon. Real steam emanates off the top of the noodles cup). Underneath that sign is Budweiser's (LED background by Daktronics and a LED video screen by Panasonic's). The Budweiser bottle also has a mechanical element to it that moves the bottle back and forth across the sign. On the bottom, the NBC screen (LED video by Panasonic's) and below that is the zipper messenger reader board (news feed by Dow Jones). Underneath the zipper is a vinyl display for Warner Brothers. "As for the other three building sides, there are about 15 or so vinyl signs, each approximately 55 feet high by 60 feet wide. TDK continues from North face with its electronic billboard transforming to a vinyl which completely wraps around the rest of the building. We also have Washington Mutual, the United States Post Office and Buffalo Jeans on the other sides of One Times Square. Collins noted, "There are a few single sign placements, but we prefer to sell the other sides as completes when we can do it. It keeps the building from looking cluttered and it gives the advertisers more 'bang for the buck.' " Collins also said that although vinyl covers the other three sides of One Times Square, he'd be happy to sell placement opportunities for LED billboards on its other sides as well. "For leasing sign positions on the building, on the North face, we try to do at least a ten year deal per position. On the other three sides, its a six months minimum leasing arrangement on the building. As of Spring, 2002, 99 % of the building is completely covered in signs. At that time, one position was opening up for leasing." Leasing the signs is one thing, keeping them on the building in tiptop condition is another, and Landmark Signs and Electrical (NY,NY) maintains that responsibility for One Times Square. The company is a full service sign and service provider which does everything from fabrication to installation, and once built, maintains and repairs the signs as required. Landmark serves the New York City metropolitan area and also handles much of the various signage in Times Square. Honors also goes to One Times Square as they are responsible for installing and maintaining at least 90% of the signs on the building. The company monitors the signs every day making sure they're OK, and when they're not, fixes them accordingly. Each building side holds five signs and they go on and off as their leases allow for. Tony Calvano, president of Landmark and his staff, keeps the signs on the building in pristine shape. "We put up all the vinyl on One Times square and maintain the incandescent lighting systems that illuminate the signs at night. There is also some chase lighting on the building that we also service." Calvano noted that Landmark also deals with all the electronic signs on the building's famous North face. "We survey all those electronic signs at least twice a day to make sure they're always at 100%. We do a lot of preventive maintenance for them and have crews that go into the signs to maintain the integrity of each unit's heating, venting and air conditioning (HVAC) systems. We're constantly changing out filters and cleaning fans as there's a lot of construction going on right now in Times Square and the fans and filters tend to get clogged up quickly." THE TIME BALL CIRCA 2000 A.D. The Ball Drop in Times Square stems from an even older ritual in England when a descending Time Ball was a popular method of signaling noon to allow pocket watches and nearby at sea ships chronometer's to be reset daily. This tradition continues onward today in Washington D.C. at the United States Naval Observatory where it still drops a Time Ball down a flag pole every day at noon. 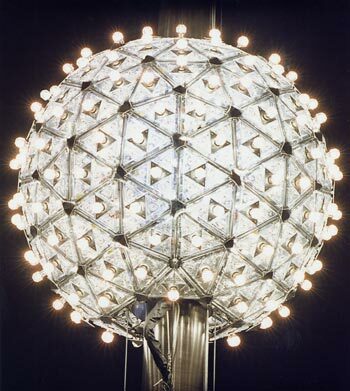 The latest incarnation of the New York's Year's Eve Time Ball is six feet in diameter and weighs 1,070 pounds. The spherical design is a geodesic dome covered with 504 Waterford crystal triangles and illuminated with 600 multi-colored Philips Habgena light bulbs, 96 high intensity strobe lights and 92 rotating pyramid mirrors. The ball is placed on a 77 foot pole and when dropped, will descend the pole's length in the last ten seconds of the year. On the day-to-day basis, One Times Square is the premiere location in the world for outdoor advertising placements. The building, however is more than just a sign tower, its real moment of glory is every New Year's Eve when the ball is dropped from a pole on the roof. New Years Eve in Times Square goes back to 1904 when the building's original owners began conducting roof-top celebrations to usher in the New Year. Ball drops were also known as 'Time Balls' and in the early years of the twentieth century, it was a popular method of signaling noon to allow pocket watches and ships' chronometers to be reset daily. 95 years later, Times Square is still the number one place to gather in the US for New Year's Eve and each year, over a half million people will hold court in the Square, waiting for that final moment. Being in Times Square on New Years Eve, people come to watch the countdown and see the moment of transition which is symbolically marked by the dropping of the silver crystal illuminated ball from the roof of One Times Square. New York's New Years Eve Ball Drop celebration courtesy of international television attracts billions of viewers who are riveted on One Times Square's North face, all waiting for the ticking clock and the minute before midnight when the ball begins its famous descent. The Ball Drop as it is known, occurs one day a year, several strokes before midnight. Although the Ball Drop is quick, its sixty second descent is planned for during the entire year that precedes it. While One Times Square is owned by Sherwood Outdoor, the ball drop is maintained as a separate event and owned and managed by Countdown Entertainment, who is the exclusive representative of the Ball Drop's year end celebration. "The Ball Drop," as noted by Jeff Straus, president, of Countdown "is New York's biggest annual promotion and takes all year to plan for, including finding sponsors, coordinating all the event participation during the six hours between the raising of the ball at 6:00 PM till its drop at midnight. There's also the planning and management of the pyrotechnics which go off at midnight." As for the famous last sixty seconds when the crystal ball is actually lowered down the flagpole, its organization is managed by Landmark and Tony Calvano's staff who prepares the ball for its one minute prior to midnight claim to fame. "To get the crystal ball ready for that night, Calvano said, "we install the rigging and the ball on One Times Square's roof top pole. Before that it takes us about two weeks of prep work for the final sixty second drop, which includes fabricating each New Year's new numbers for the upcoming year and installing them. We also maintain the actual sixty second ball drop operation as the clock strikes midnight." As Times Square is being completely rebuilt with a new neighborhood of 40 - 50 story skyscrapers, One Times Square, although only a 25 story building stands as a giant among its companions. "The building is as much as an international icon as it ever was," says Sherwood's Collins. "We have the added value for our customers that at one time or another, everyone with a television will see this building. either in the news on any television coverage of Times Square or from any movie about New York City. You can build anything you want around One Times Square, but that doesn't change what the building stands for or does." Tim Thomkins, president of the Times Square Business Improvement District (BID) noted, "For all the activity of new construction around Times Square, One Times Square remains a constant in the sea of change of its surrounding skyline amidst all the heightened intensity and frenetic energy of the area, it continues to be the "voice" and representational icon of Times Square."